This extensively revised and expanded third edition of the Artech House bestseller, Computational Electrodynamics: The Finite-Difference Time-Domain Method, offers you the most up-to-date and definitive resource on this critical method for solving Maxwell's equations. There has been considerable advancement in FDTD computational technology over the past few years, and this new edition brings you the very latest details with four new invited chapters on advanced techniques for PSTD, unconditional stability, provably stable FDTD-FETD hybrids, and hardware acceleration. Moreover, you find many completely new sections throughout the book, including major updates on convolutional PML ABCs; dispersive, nonlinear, classical-gain, and quantum-gain materials; and micro-, nano-, and bio- photonics. This single resource provides complete guidance on FDTD techniques and applications, from basic concepts, to the current state-of-the-art. It enables you to more efficiently and effectively design and analyze key electronics and photonics technologies, including wireless communications devices, high-speed digital and microwave circuits, and integrated optics. You find sample FDTD codes written in MATLAB that serve as a self-guided refresher, and examples of how to use the FDTD method on a wide range of projects in the field. What's more, to supplement the third edition, the authors and publisher have created a website where you can find solutions to the problems, sample FDTD PML codes, text updates/errata, and downloadable color graphics and videos. 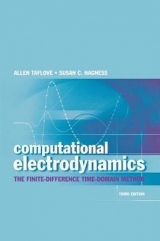 Consequently, this new edition is the ideal textbook for both a senior-year undergraduate elective course and a graduate course in computational electrodynamics. Supplementary Material: Visit http://us.artechhouse.com/Assets/downloads/taflove_errata.pdf to download the book's errata sheet. Visit http://www.ece.northwestern.edu/ecefaculty/Allen1.html for Allen Taflove's web page at Northwestern University. Visit http://www.engr.wisc.edu/ece/faculty/hagness_susan.html for Susan Hagness's web page at the University of Wisconsin-Madison. Visit http://us.artechhouse.com/Assets/downloads/fdtd1D.zip to download the 1D FDTD code. Visit http://us.artechhouse.com/Assets/downloads/fdtd2D.zip to download the 2D FDTD code with split-field PML. Visit http://us.artechhouse.com/Assets/downloads/fdtd3D_pec.zip to download the 3D FDTD code with PEC boundary conditions. Visit http://us.artechhouse.com/Assets/downloads/fdtd3D_UPML.zip to download the 3D FDTD code with UPML boundary conditions. Visit http://us.artechhouse.com/Assets/downloads/fortran.zip to download the CPML Fortran code. Electrodynamics Entering the 21st Century. The One-Dimensional Scalar Wave Equation.Introduction to Maxwell 's Equations and the Yee Algorithm. Numerical Dispersion and Stability. Incident Wave Source Conditions. Analytical Absorbing Boundary Conditions. Perfectly Matched Layer Absorbing Boundary Conditions. Near-to-Far-Field Transformation. Dispersive, Nonlinear, and Gain Materials. Local Subcell Models of Fine Geometrical Features. Nonuniform Grids, Nonorthogonal Grids, Unstructured Grids, and Subgrids. Bodies of Revolution. Periodic Structures. Modeling of Antennas. High-Speed Electronic Circuits with Active and Nonlinear Components. Photonics. Advances in PSTD Techniques. Advances in Unconditionally Stable Techniques. Advances in Hybrid FDTD-FEM Techniques. Advances in Hardware Acceleration for FDTD. Allen Taflove Dr. Allen Taflove has pioneered the finite-difference time-domain method since 1972, and is a leading authority in the field of computational electrodynamics. He is a professor at Northwestern University, where he also received his B.S., M.S. and Ph.D. degrees. A Fellow of IEEE, Dr. Taflove is listed on ISIHighlyCited.com as one of the most-cited researchers in the world. Susan C. Hagness Dr. Susan Hagness is a professor at the University of Wisconsin-Madison. She received her B.S. and Ph.D. degrees from Northwestern University. A senior member of IEEE, Dr. Hagness has received many awards and recognitions including the Presidential Early Career Award for Scientists and Engineers and the MIT TR100 award as one of the top 100 young innovators in the world.